Saves water and reduces water pressure by the fact that the valve has to be turned off just to allow the spray to be held in place. 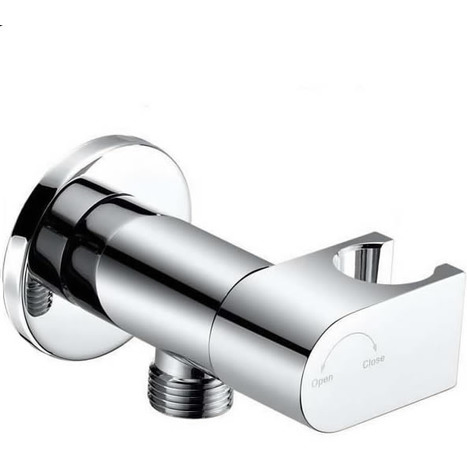 VAL2450: Chromed brass with shower mount with the unique auto-prompt water shut off valve. Valve is closed and water shut off when the shower mount is horizontal and the shower head is placed in the holder. Manufactured for us from solid brass with mirror chrome finish. Wall plate 50mm Diameter, chrome on brass. 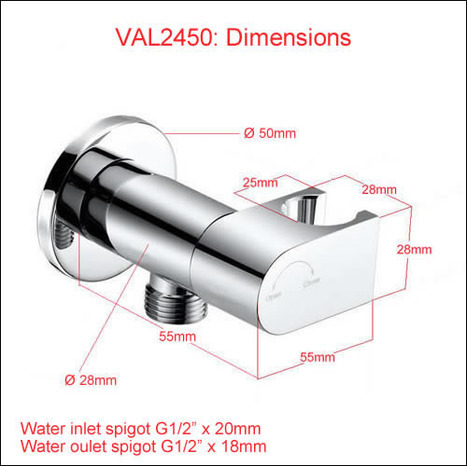 VAL2450: Auto-prompt water shut off shower valve and mount. Premium quality chromed solid brass dock with integral shower holder and auto-prompt shut off valve. To turn water on remove shower head from dock and turn dock to the vertical position, to place the shower back in the dock necessitates turning the dock head back to the horizontal position which in turn closes the water supply to the shower hose and head, thus auto-prompting you to turn off the water supply after every use.